Greetings! How’d everyone spend last weekend’s holiday? 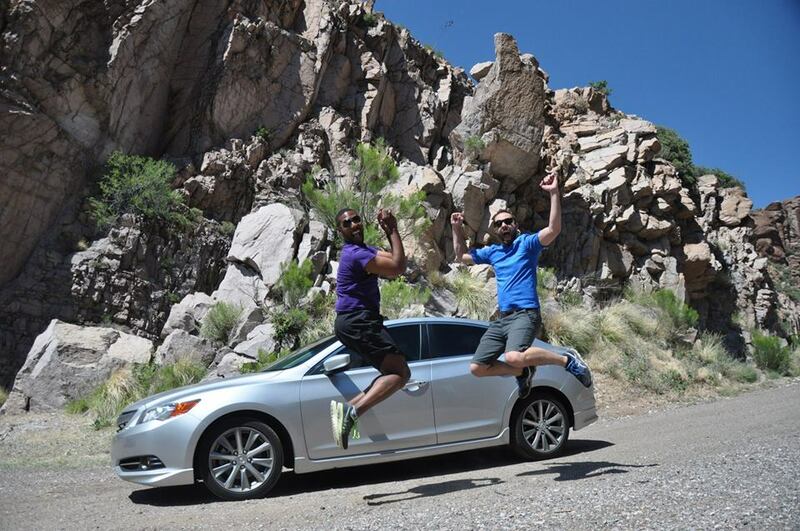 My buddy Lance visited from Dallas for a few days and it seemed only fitting that I treat him to a good old-fashioned Arizona road trip. 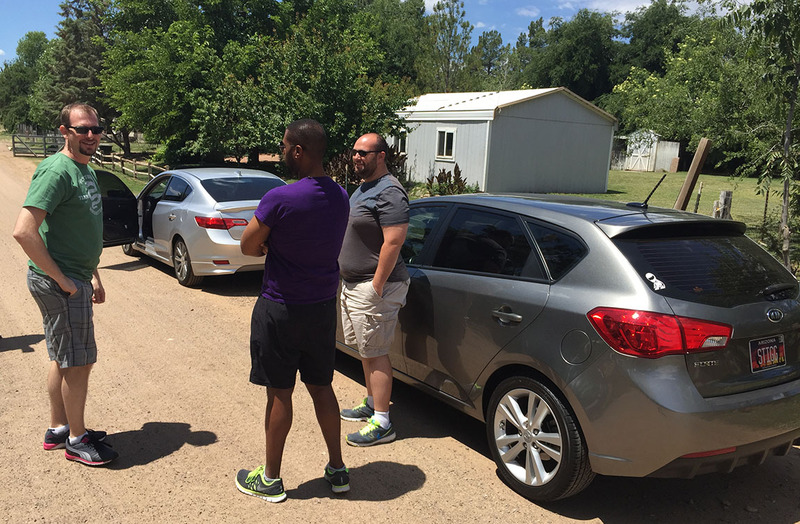 I rounded up a few other guys and we hit the highway at 10:00 a.m. on Monday morning in my 2013 Acura ILX and in James’ 2011 Kia Forte 5-door SX. After a quick fuel stop at Chevron on Highway 87, we continued northbound to the exit for a teeny town called Gisela. I’d visited the area two years ago but wanted to introduce my 4 friends to the sweet 5-mile road leading there. 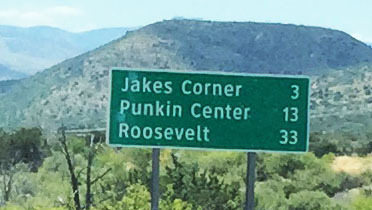 The other place I’d wanted to check out was a town off Highway 188 on the way to Roosevelt Lake called “Punkin Center.” Now, there’s absolutely nothing to see or do in Punkin Center. 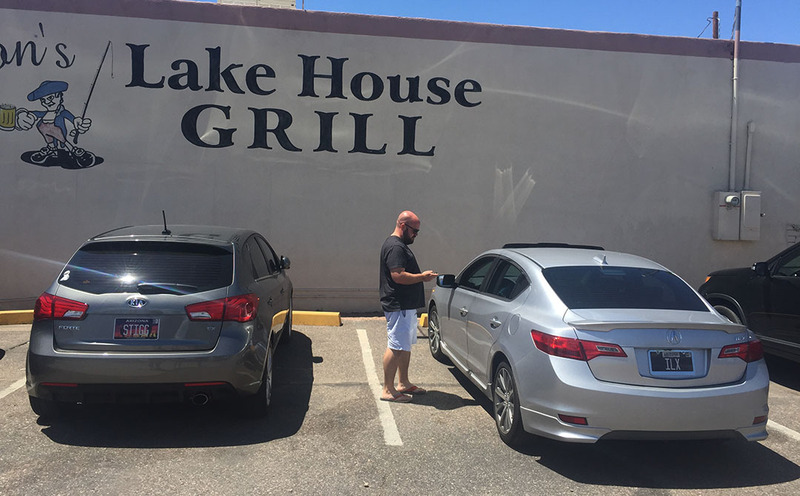 Well, I guess there’s a thrift shop, a little bar & grill, a quaint lodge, and a few locals who looked at us like the foreigners we were when we rolled into town. 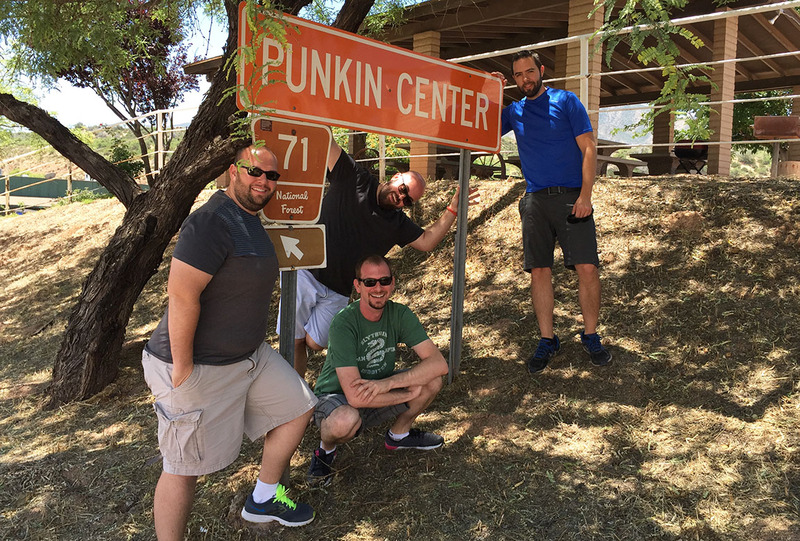 After staging the Forte & the ILX for a picture in front of the signature Punkin Center sign, a couple of rough looking guys rolling by in a Dodge pickup truck rolled down their window. 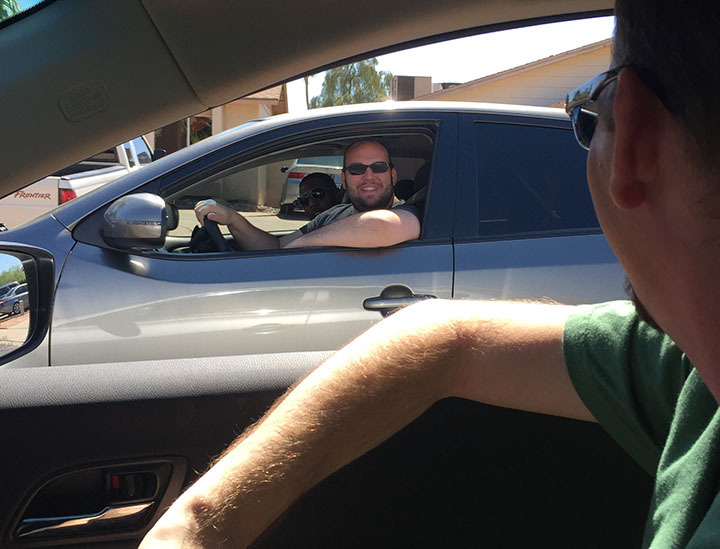 “You guys gonna drag race?” the driver asked James. James told him that we were. Ha! 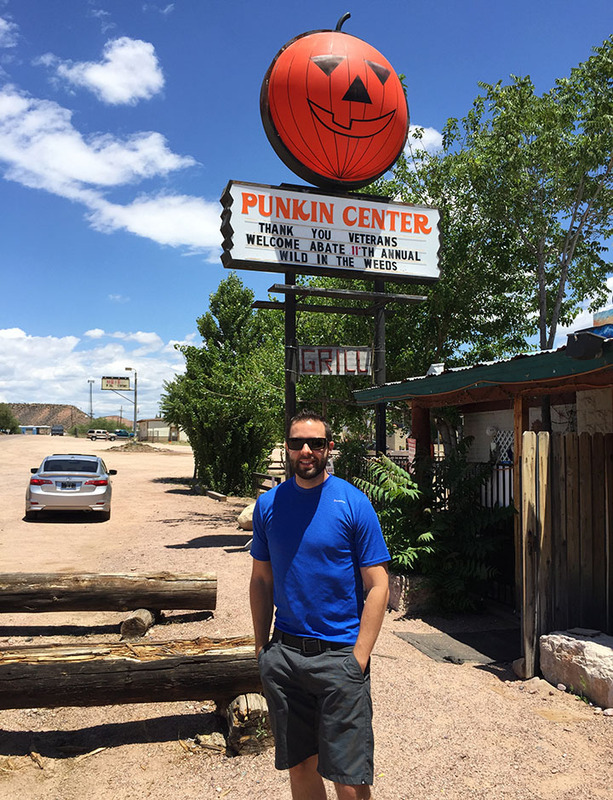 The lodge at Punkin dates back to 1912 and is available for $235 for a one-week stay. I might have to plan a longer trip out. From there it was time to head out and grab a bite to eat. 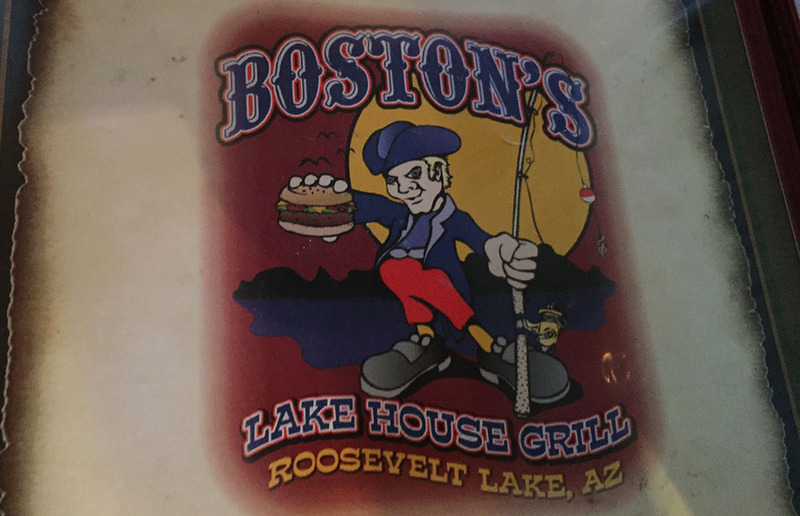 I’d found a decent looking place about 30 miles down Highway 188 called Boston’s Lake House Grill. 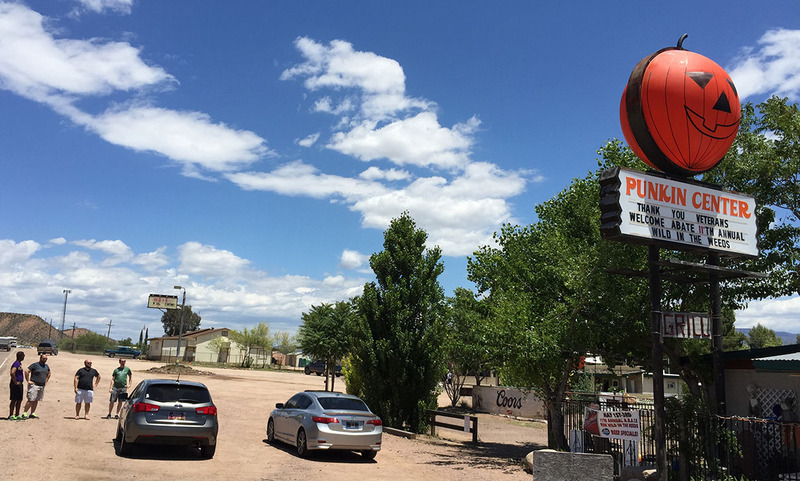 We dined on a cheese crisp with green chile and then some greasy hamburgers. Even better than the food was the audio soundtrack. When Paula Abdul’s 1988 classic “Straight Up” came on the surround sound, our entire table lit up in karaoke unison. The forest service guy with the big mustache in the corner booth may have given us a dirty look at around that time. 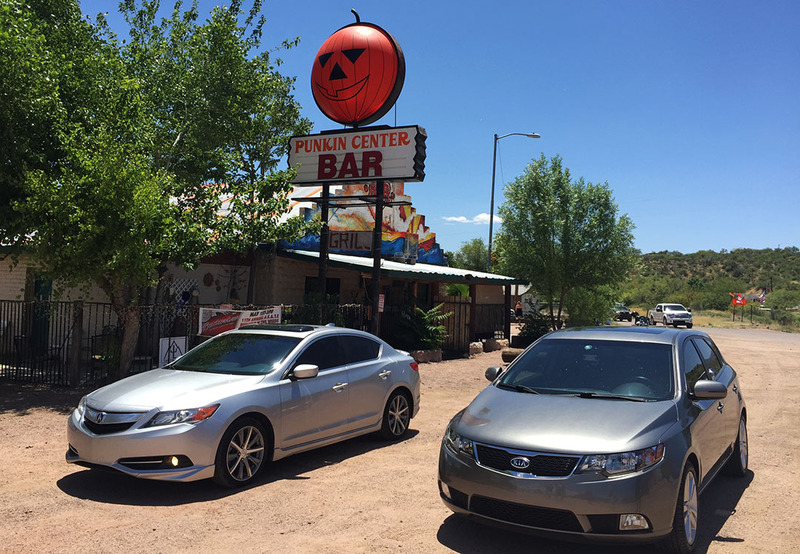 After din, we did a car & driver switcheroo – I took the Kia this time – and we completed our loop via US Highway 60 on through Miami, Superior, and into Apache Junction at the east end of the Phoenix metro area. 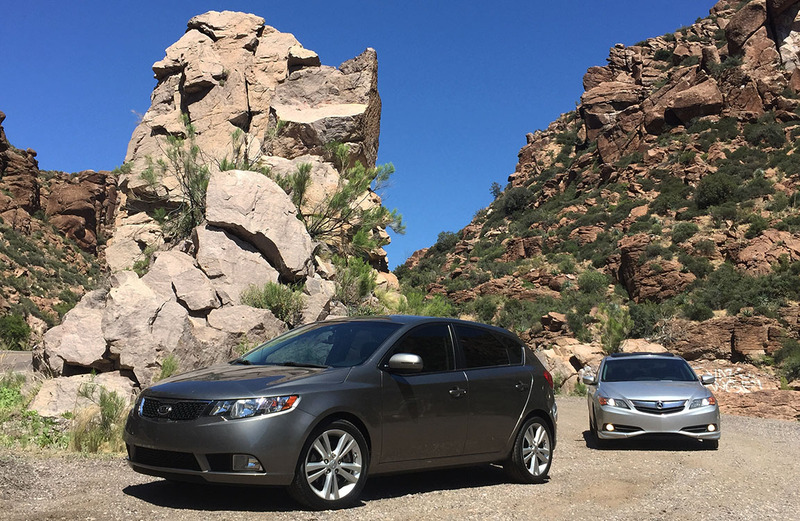 I found the Forte to be quite the impressive little ride. James’ car has only 49,000 miles on it and looks/smells new. The seats were my favorite feature. I haven’t had a car with cloth seats since my 1989 Prelude when I was 17! I forgot how comfortable they are! Thanks to the guys for joining us, and to the rest of you for tuning in electronically. 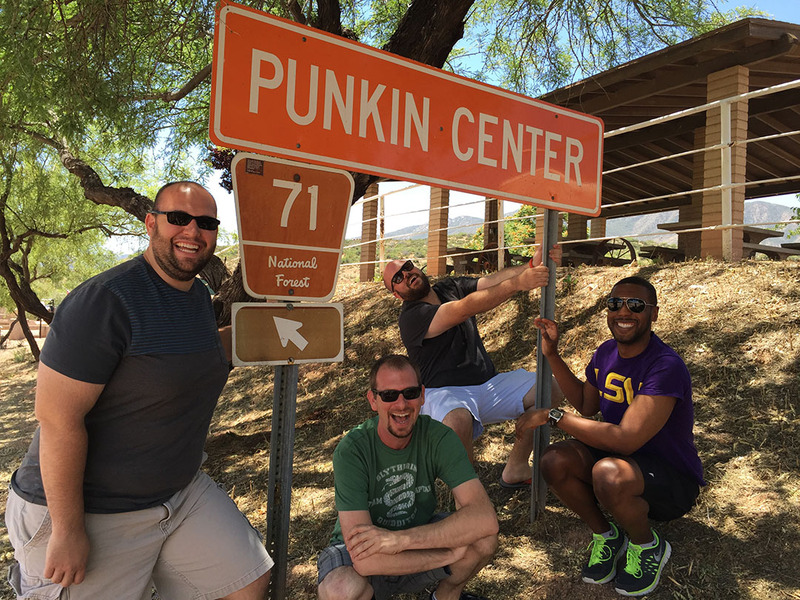 Few pics in Punkin Center. It’s like Halloween every day! Even on a holiday weekend, not much happening here! Peter taking a picture. 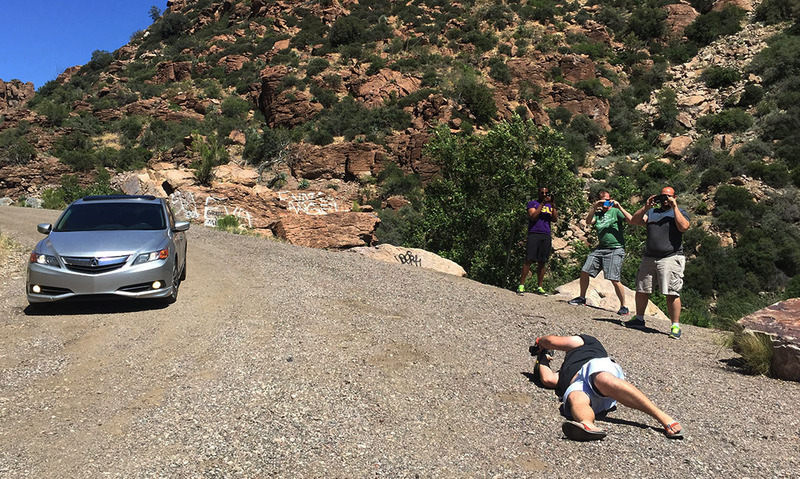 And people taking a picture of me, taking a picture of Peter, taking a picture. Jump! In the style of those old Toyota commercials (“I love what you do for me!”). 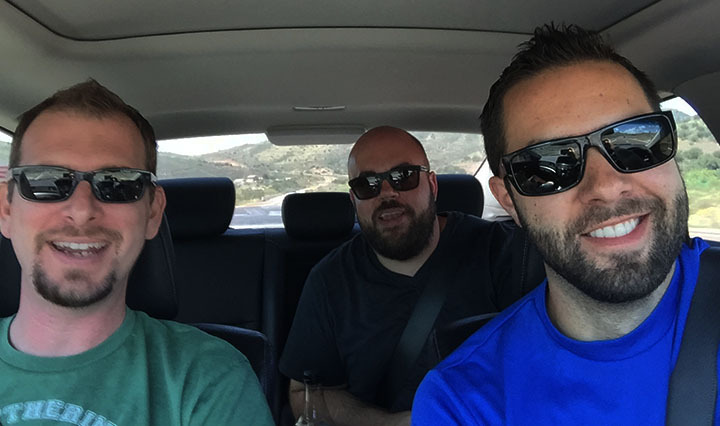 In-car karaoke, courtesy of Lance, Peter, and Tyson. 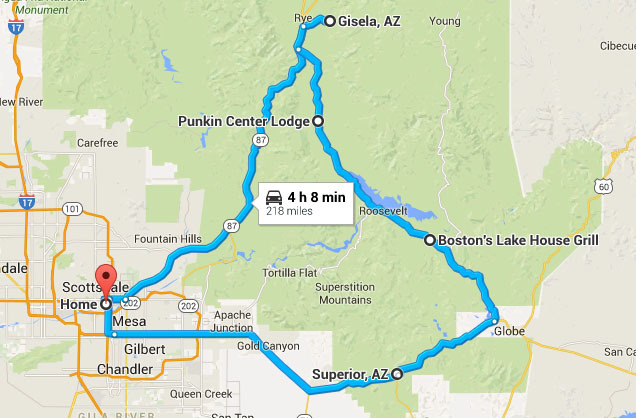 Next up: Ever wanted an inside look at the Grand Canyon? 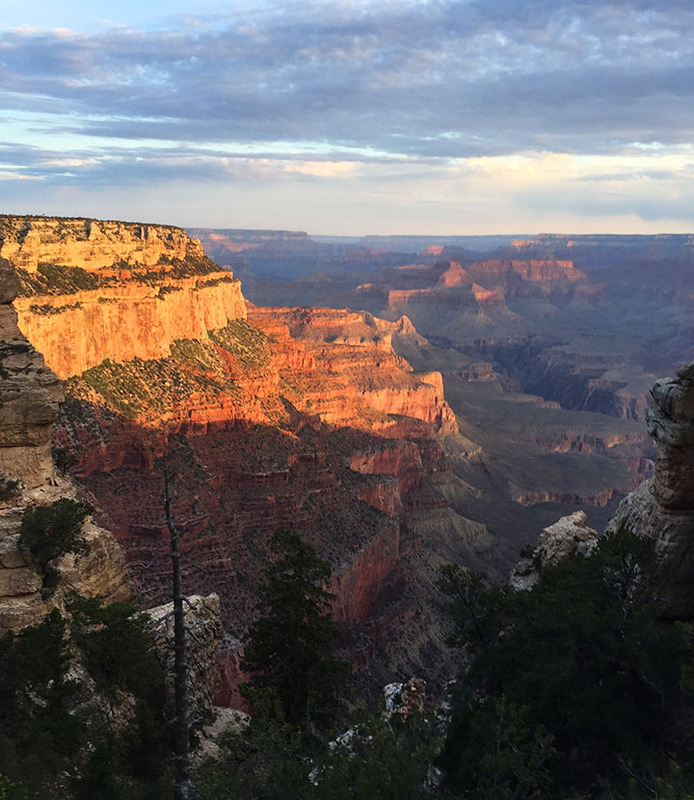 I’m about to take you from the South Rim, deep down to its base at the Colorado River, and up the north side… via 26-mile hike. My legs are burning from yesterday’s trek but the story was worth it. 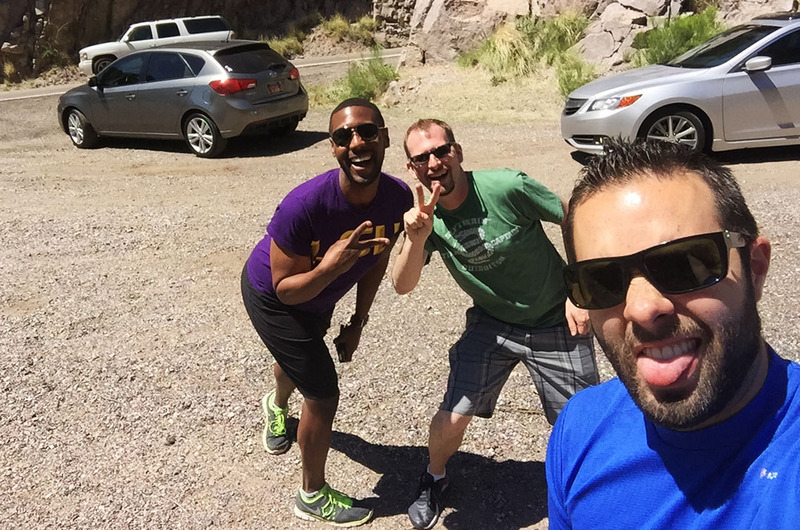 This entry was posted on May 30, 2015 at 7:08 pm and is filed under Arizona, ILX, Road Trip. You can follow any responses to this entry through the RSS 2.0 feed. You can leave a response, or trackback from your own site. Love this blog post! Thanks again Hugie for an awesome road trip and your generous hospitality!! Best weekend I’ve had in a long time. Let’s plan another road trip in the future. Thanks for being a part of it! I’m totally game for another road trip with you. Bring the soundtrack and the dance moves, and we’re set! Looks like another fun time. 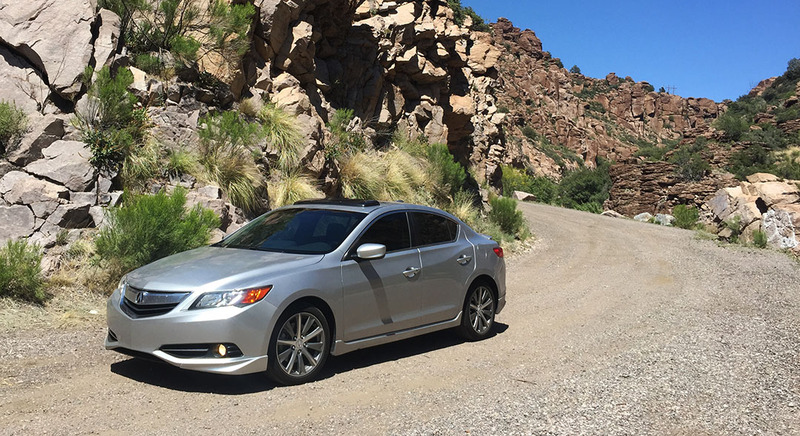 ILX is always looking great too! Thank you Nate! 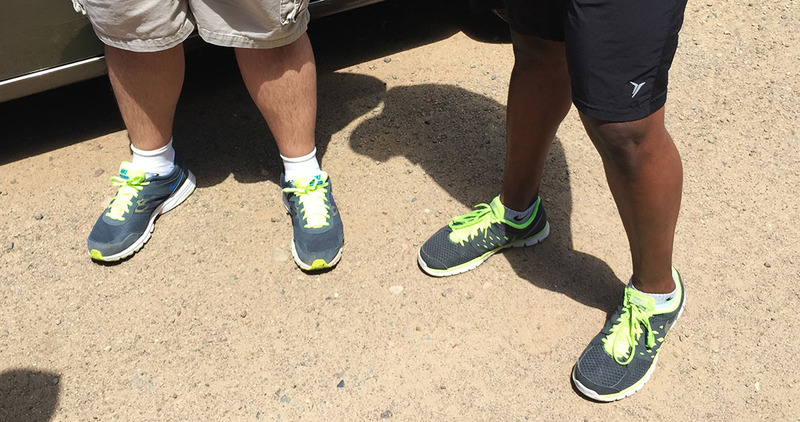 It was a spur-of-the-moment trip that ended up being a lot of fun. One of these days you’ll have to join me for one. I finally washed the ILX tonight – it had been WEEKS!